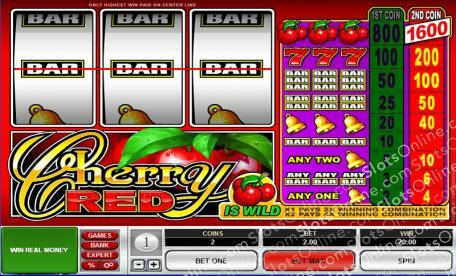 Red cherries are such a classic slots symbol that players hardly ever notice when they are in a game. Click here to play! Most of the time, they act as special symbol that award a low paying prize even if only 1 is on the payline. Sometimes they act as just a normal symbol. In the Cherry Red slots, though, they have been promoted to the featured symbol, awarding special wild symbol payouts or even the jackpot prize. The Cherry Red slots are something of an homage to basic slots games. Only using classic symbols like gold bells, BAR, double BAR, triple BAR, lucky red 7s, and red cherries, the Cherry Red slots will give a sense of nostalgia to any longtime slots player. If you like easy slots games that remind you of the times when most slots games just used a handful of symbols rather than the myriad you now see in video slots varieties, then the Cherry Red slots are a great bit of fun. Rewarding payouts and fast pace play make this a great value game for people who want to keep things simple. The Red Cherry symbols are wild in the Cherry Red slots, and they award the jackpot when three are on the payline when 2 coins are played. Also, when 1 symbol substitutes on a payline, the prize is doubled. When 2 symbols substitute on a payline, the prize is multiplied by 4.